Enjoy the romance at Cabo San Lucas Lovers Beach. This beach is so secluded that the only access is by water. This is usually a water taxi from the marina which at the same time you'll be taken on a short tour of this gorgeous part of Los Cabos. It's a good idea to remember your camera because you'll want to remember what you have experienced. Lovers Beach isn't just a beach by the sea, it's surrounded with out of this world rock formations. This is the tip of the Baja Peninsula. Your Cabo adventure starts as soon as the water taxi drops you off. 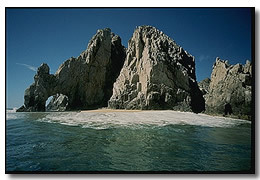 You're on the safe side of Cabo San Lucas so you can go in the Sea Of Cortez for some snorkeling. 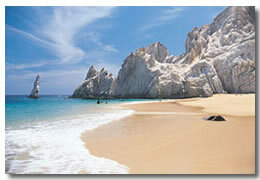 Lovers Beach is on of the few beaches that it's safe to swim in Cabo San Lucas, but it's one of the quietist. You don't get vendors spoiling your day here. If you feel like some exercise you can attempt to climb the rocks. Remember though to take some decent footwear, bare feet or flip flops are definitely a no-no. Tours are available of the Baja Peninsula in glass bottomed boats, and this is a great way to get to Cabo San Lucas Lovers Beach. Snorkeling is all part of the tour as well. You can get dropped of at the beach and arrange a time to be picked up by the tour boat. 3.00 pm is usually the latest you can be picked again. With the tours starting at 9.00 am you can enjoy a few hours snorkeling and taking in the scenery. Lovers Beach is very well known in Cabo San Lucas, and has become a land mark that most people on their Cabo vacation try and visit at least once. Why not be one of them.